The results depressed me. I had hoped that the diagnosis of early brain injury was better informed and more helpful than when I was an active neonatologist. I was wrong. Several hundred parents wrote me their stories and while there was good news in a few, the majority of parents in this random survey were confused and even angry about the lack of direction and help that they received at discharge. It seems that parents are still generally told that the future is largely unknown and a “wait-and-see” philosophy is still prevalent. Children at risk because of a scan diagnosed hemorrhage or PVL are commonly referred to an Early Intervention or Birth to Three Program and most parents report this as helpful and supportive. But there is a problem. The first diagnosis is “at risk” of developmental delay. If the baby is slow in attaining milestones, the diagnosis is changed to Developmental Delay. I believe there are some really big problems with this system. For most babies, a poor score on a standardized test determines the diagnosis of Developmental Delay… This means that important problems are missed. For example, a baby with a Brachial Plexus Injury (BPI) often does not qualify for Early Intervention as only one arm and hand are affected. In this situation, the child still scores in the “normal” range on screening tests. For other children, who may ultimately be given a diagnosis of Cerebral Palsy (CP), the tests in common usage to get you into an EI program do not reflect how a task is accomplished. This means that poor form is ignored until it is “bad enough” to warrant expert treatment. The last problem is that the diagnosis of Developmental Delay ignores the etiology of the baby’s problems and so specific treatment for CP or BPI is again not given until they are arbitrarily decided to be bad enough to move to a clinic for evaluation by an “expert”. This is too little, too late. Lesion specific treatment should be available earlier during the important birth to 4 to 6 years of exuberant brain growth and neuroplasticity. As the brain grows, it connects up and there is no logical reason to “wait and see”. 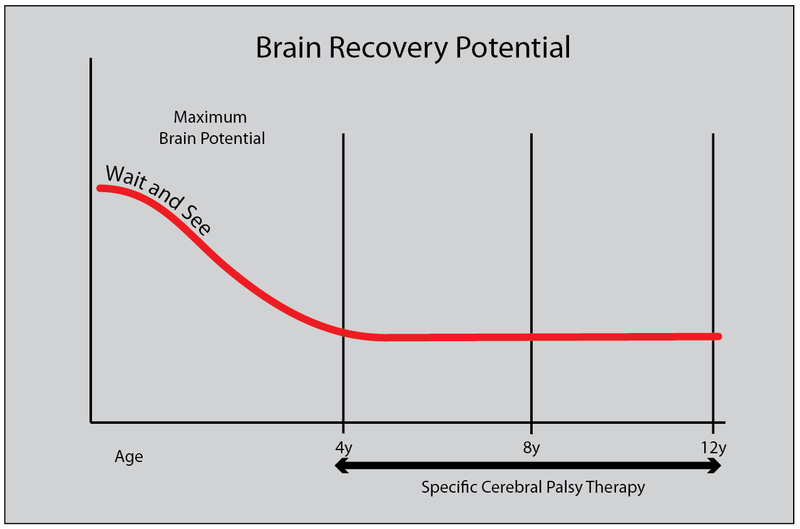 This is the time when there is the best possible chance for normalizing function after a brain or nerve injury. The “wait-and-see” approach is cheaper for insurance companies and governments in the short run, but to my knowledge there is absolutely no evidence that it is the correct approach for a baby with a scan documented brain injury or obvious nerve injury. Brain scans can document a problem and equally, a baby with BPI has a nonfunctioning arm. You don’t need to be a rocket scientist to figure out that the baby’s brain is not going to “wire-in” that arm and hand if it never gets to see it. A hand lying at the side of the body in a child with BPI or a tightly fisted and retracted arm/hand in a child with CP is a hand that the brain doesn’t learn about and useful recovery time is lost. There are specific “best practice” and evidence-informed therapies and treatment for both these common problems that are largely only made available to children when they are “bad enough”. They magically become available when the child is referred to a specialized clinic and properly diagnosed, usually at age 3 to 4 years. For some, it is even later. I am now clinically retired but I can write about my approach, developed over my long and varied career. Physicians and surgeons need to know a lot about a wide variety of problems within their own specialties. In contrast, parents only need to become world-class experts in their child’s problem. An accurate, specific diagnosis of the damage is step one. I think many goodhearted doctors think that they are sparing parents worry by delaying a diagnosis. In my experience, parents do much better when they know what is the problem and a plan is developed to deal with it. That said, in the early days, no one can give a really accurate prediction of outcome, because the extent of recovery is so variable. But for babies with PVL or hemorrhage into the brain, you can determine if it affects one side or both sides of the brain. And more importantly, you can also determine how much of the brain is intact and apparently normal. With BPI, the severity can be estimated within weeks of birth, both by neurophysiological testing and the extent of associated injuries. If your older child still has a generic diagnosis like (hemiplegia), you need more information. More on this next week. I am glad to hear that there are people out there thinking about the child and a better future, thanks for this post!